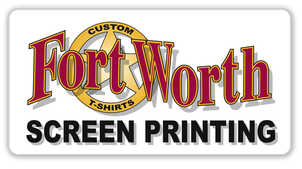 ​Since 1997, Fort Worth Screen Printing has provided textile screen printing services to promotional products distributors, marketing firms, advertising agencies and end users throughout the United States. We are even sought out by other screen printers to produce their more complex and overflow jobs for them. We print four color process, simulated process and specialty inks that add value to the final product. With seven automatic screen presses, and access to nine more, there is no job too large for us. We use all the latest technologies and controls to ensure that you get the highest quality and longest lasting imprints. Our automated production means our prices are competitive and your job gets done on time. Whatever your art needs are, we can take care of them. Whether from concept to final print or cleaning up and repairing art that you already have. We have you covered. We can do the artwork for any products you sell - even the ones we do not produce! We print on your supplied goods or goods that we supply for you: T-shirts, jackets, bags, caps, aprons, sport shirts, shorts, sweatshirts & more! Fast Turnaround: Production time for most work is 5-10 business days from receipt of art and goods. Rush service is available from $50 and up. We can recreate full color images using opaque pigmented inks and award winning separations on any color garment. We utilize a halftone under-base to create bright vivid prints without a heavy hand. Get your order going today!